The author has previously published on this topic and portions of this article may have been reprinted from the September 2015 issue of Metal Construction News (tinyurl.com/ztce6u8). Hal Robbins has a degree in Chemistry from Radford University. Previously, he worked at CertainTeed’s Insulation Group from 1981 to 1994 in Product Development, with a focus on Facings, Adhesives, Coatings, and Fire Testing. Mr. Robbins has been the Technical Director for Lamtec Corporation (lamtec.com/about-lamtec) since 1994 and is actively involved with ASHRAE and ASTM. He can be reached at RobbinsHal@lamtec.com. Understanding and complying with today’s evolving energy codes and standards presents unique challenges for architects, designers, and builders of pre-engineered metal buildings. As the new energy codes and standards (the International Energy Conservation Code [IECC] 2012 and 2015 and ASHRAE 90.1-2010 and 2013) are being adopted across the country, specifiers are finding that conventional single and double layer fiber glass insulation systems may no longer be able to meet the thermal performance requirements specified for metal building roofs and walls. 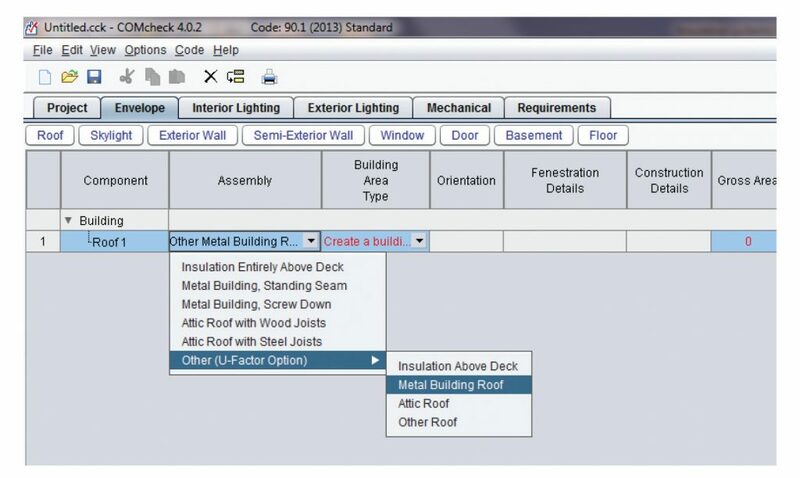 In an effort to navigate (and hopefully simplify) energy code compliance, the intent of this article is to help specifiers determine code adoption status using web-based tools and to review various high R-Value/Low U-Factor insulation systems currently available for metal building roofs and walls that provide code compliant options. Many states and municipalities have adopted recent versions of either the IECC or ASHRAE 90.1 standard, or drafted their own energy codes. 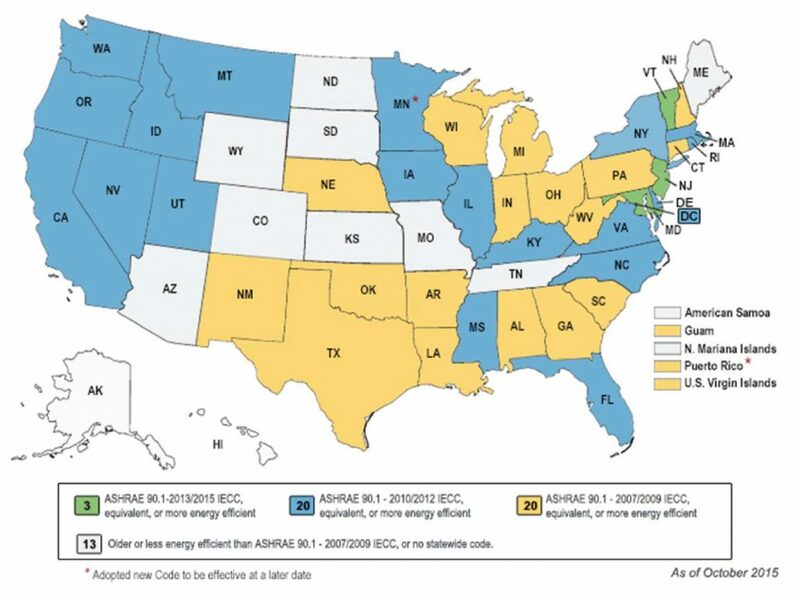 The Department of Energy (DOE) has summarized the current status of energy codes and standards adoption across the United States in the map below. This map is available at www.energycodes.gov. 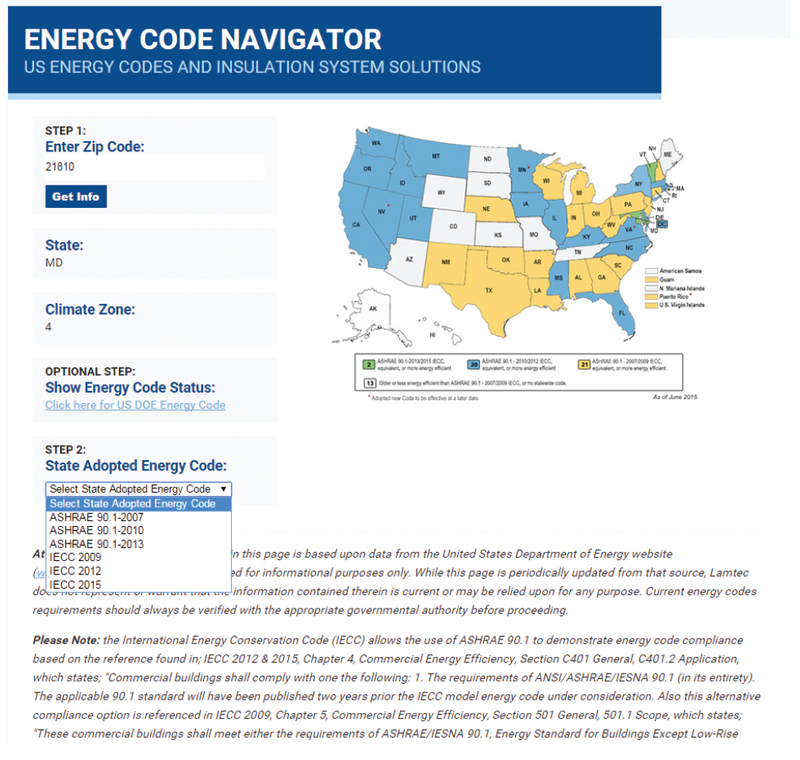 Additional information relating to code adoptions can be found using the Energy Code Navigator at http://lamtec.com/energy-code-navigator/; this tool was created to help specifiers navigate the code-adoption process in a few simple steps, as listed and shown below. Step 1: Enter the zip code for the project. The State and Climate Zone are then provided. Step 2: Select the applicable code from the drop-down list. If this is not known, a link is provided that will take the user to the DOE website where this can be determined. Once the code is selected, a table will display showing prescriptive assembly R-Values and U-Factors as well as alternate systems, shown in the table as “Compliance Options.” The Compliance Options will provide equivalent or better thermal performance than the prescriptive solution (see table below). Note: There are provisions in the codes to allow for the use of these alternate non-prescribed “Compliance Options” to be used, as long as the thermal performance can be demonstrated by a thermal test report or finite element analysis (FEA) model. This documentation is typically available from the insulation suppliers. Once the applicable U-Factor(s) have been determined for the project, the specifier must select an insulation system that best meets the needs of the project. In some cases, this is the prescriptive option; however, in many cases a better performing insulation system is necessary to compensate for a lower performing component of the building’s envelope. As guidance, the following is a review of new High R-Value/Low U-Factor insulation systems currently available for metal building roofs and walls. High R-Value/low U-Factor metal building roof insulation systems can be broken down into 2 generic categories: filled cavity fiber glass and rigid continuous foam insulation. Long Tab Banded (LTB) system. Both the LTB and liner systems fill the cavity between the purlins with fiber glass insulation. A minimum of 2 layers are used; one layer is installed between and parallel to the purlins and one layer on top of and perpendicular to the purlins. In both cases the insulation is supported by a series of bands attached to the underside of the purlins. From a thermal performance standpoint, both systems perform comparably. Contrary to some of the claims being made in the marketplace, actual side-by-side thermal testing by an independent accredited laboratory has demonstrated comparable performance with both the LTB and liner systems. ASTM C1363 test results for 2 LTB and liner assemblies using 2 different insulation levels are shown in Table 1. These results demonstrate that the filled cavity/LTB system and the liner system performed comparably in this side-by-side test program. Due to the inherent variability in this type of testing, the slight difference seen should not be considered to be significant. With the LTB system, the vapor retarder is laminated to the lower fiber glass layer and the facing tabs follow along and over the purlins, where they are sealed together to maintain the continuity of the vapor retarder. With the LTB system, the lower purlin flanges are exposed, which allows for unobstructed installation of mechanical and electrical equipment. With the liner system, the vapor retarder is installed separately from the insulation under the purlins and above the banding. With a liner, the purlins are covered so they are not visible within the building. If a liner is being used, it will be necessary to cut into the vapor retarder to gain access to the structural components of the building. Does insulation system meet the required U-factor? Does the insulation system provide a smooth, attractive installed appearance? Do the facility operators need to have easy access to the purlins? What is the installed cost and long-term performance? Continuous insulation provides a strong, durable, and attractive interior finish. It is often a preferred option for use in applications where high interior humidity is present, such as indoor swimming pools and nurseries. Continuous insulation is also commonly used in applications requiring a low interior temperature, such as cold storage buildings. In some cases, hybrid systems utilizing a combination of foam and fiber glass can be used to achieve required thermal performance. When considered, these systems should be reviewed with your insulation, fastener, and building supplier to avoid any unintended consequences such as condensation or structural issues. When choosing continuous insulation, it is advisable to confirm that the fire ratings of the products are acceptable for use by the local fire codes. Depending upon the fire rating, a separate thermal barrier may be required by code. High R-Value/low U-Factor metal building wall insulation systems can also be broken down into 2 generic categories: filled cavity systems (fiber glass) and rigid continuous insulation (foam). Single-layer systems that use a combination of fiber glass (to fill the cavity between the girts) and foam tape (between the wall panels and girts). Double-layer systems that are essentially the single layer system detailed above, with a second layer of fiber glass installed between the outer girt flanges and the wall panels for added thermal performance. Depending upon the U-factors required, foam tape or 1” foam thermal blocks are also used. With these double layer systems, U-factors as low as 0.036 can be achieved. As detailed previously for the roof system, continuous foam insulation is preferred for high-temperature, high-humidity applications. The same advantages and caveats discussed for the roof also apply to the walls. New web-based tools have been introduced to help architects, designers, and builders navigate the adoption status of state energy codes and provide guidance on the insulation system options available for code compliance. A variety of new high R-Value/low U-Factor insulation systems have been developed for metal building roofs and walls that meet the thermal requirements specified in the current energy codes and standards. 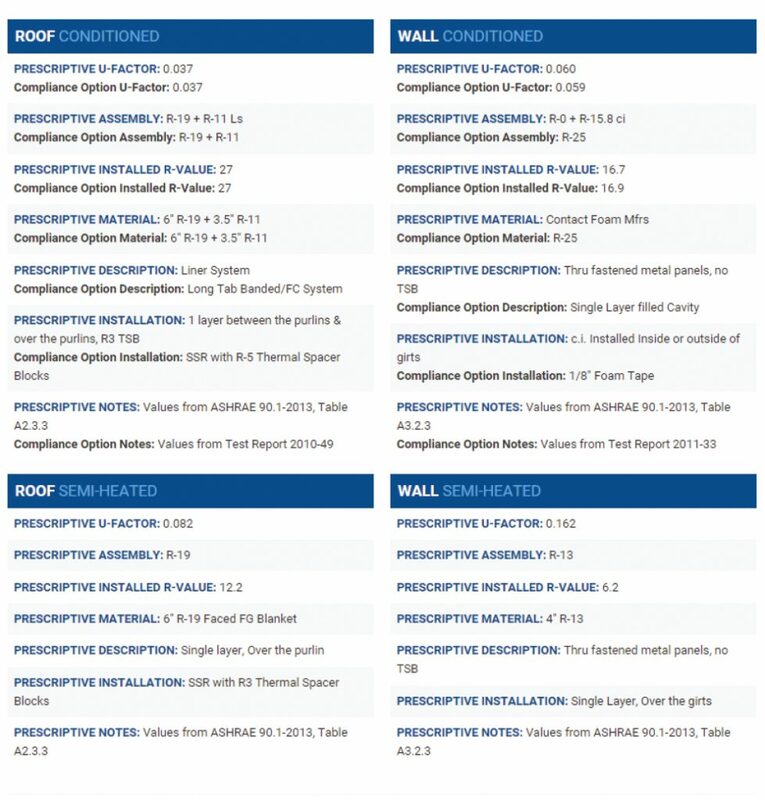 While these new systems may not currently be listed in the Appendix Tables of the ASHRAE 90.1 Standard, provisions in the codes allow for alternate systems to be used, as long as supporting thermal performance documentation is provided. When considering the insulation system options available for your application, it is important to consult with your insulation supplier or contractor. They will be able to provide guidance on thermal performance, installation, and cost. To learn more about options for reaching out to compliance experts in your area, see the sidebar below, Code Busters. Insulating metal buildings is not as simple as it once was. Do you follow ASHRAE 90.1-2010, IECC-2012, IECC-2009, or the new IECC-2015? Attempting to navigate the complex world of code compliance can provide somewhat of a challenge. There are 2 key differences between ASHRAE 90.1-2010 and IECC-2012 regarding the building envelope and building insulation. Only ASHRAE 90.1 has a specific designation for a building that is unconditioned and only semi-heated. Semi-heated unconditioned buildings will meet the energy code with a single layer system in the roof and walls based on ASHRAE 90.1-2010. It is also important to keep in mind that state codes will override local city codes—unless the local code is more stringent, in which case it must be used. In addition to the code compliance tools listed above, NIA’s metal building laminator members can be a valuable resource. For guidance from a NIA laminator in your state, visit www.insulation.org/membership. NIA’s online membership directory can be used to search for insulation laminators, contractors, distributor/fabricators, and manufacturers by specialty and location.